Opis: Are you an early riser? Over the last month or so, the bright planets Jupiter and Saturn have come to adorn eastern skies before sunrise. 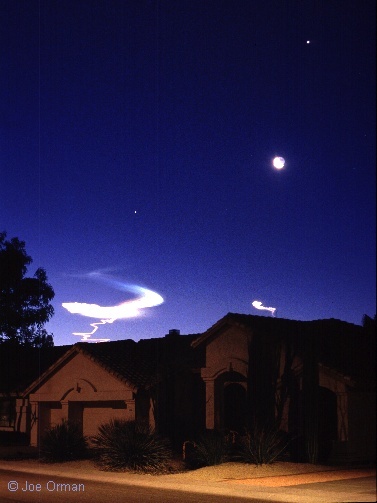 In fact, astrophotographer Joe Orman anticipated that an early bird's reward for looking east on June 10 would be this pleasing arrangement of Jupiter (top right), a crescent Moon, and Saturn (near center), but he was surprised to also find these eerie, iridescent clouds wafting through the pre-dawn sky over suburban Phoenix, Arizona, USA. The clouds turned out to be rocket engine trails from defense missile tests at the range in White Sands, New Mexico ... about 300 miles away. While the Moon's phase is just past new moon, gone now from the pre-dawn horizon, brilliant Jupiter and Saturn can still be seen high toward the southeast in the constellation Aries.